Double-check your post to make sure the tone is friendly and supportive to people who might not know anything about positive reinforcement training – we want to be encouraging and upbeat. 2. Save the #Train4Rewards button. and include it in your post with a no-follow link to the blog party page. (See below for more info). 3. Add your blog to the list on companionanimalpsychology.com. The list will be open from 5am PST on 14th June until 8am PST on 16th June. Don’t miss the deadline! Blog posts can be about any aspect of reward-based training and can use text, photo or video, so feel free to use your imagination. 1. Bring your best post. It’s like wearing your favourite dress to a party. The people who got the most out of last year’s blog party wrote new posts. If you prefer to use an older post, you should at least try to update it. People are more likely to share new content. 2. Take time to edit. It’s generally best if you can set aside the first draft of your post for a day or two, and then come back to edit. Re-writing is always an important part of the writing process. 3. Use a great photo. When you add your post to the list here, you will get the chance to choose the photo that will appear as your thumbnail. Everyone will have the Train for Rewards button, so if you have your own photo it will make yours stand out. Also, photos really help with sharing on social media. You can use your own photo, find one that is available for free use or pay for a stock photo (just make sure you’re following copyright rules). If your post is a video, you might like to include a still from the video as a photo in your post. What is allowed: anything that celebrates the reward-based training of companion animals. What is not allowed: training that uses pain, including but not limited to choke and prong collars, electronic shock collars, alpha rolls, or other aversive techniques; spam and blog posts of a commercial nature. I reserve the right to remove posts if they are inappropriate and/or not within the spirit of the blog party. Please keep posts family-friendly. No discussions will be entered into. Right click on the button image and save it to your computer. Position the button where you would like it in your blog post. Then make the image link to the Train for Rewards blog party page. If you need technical help, please ask! 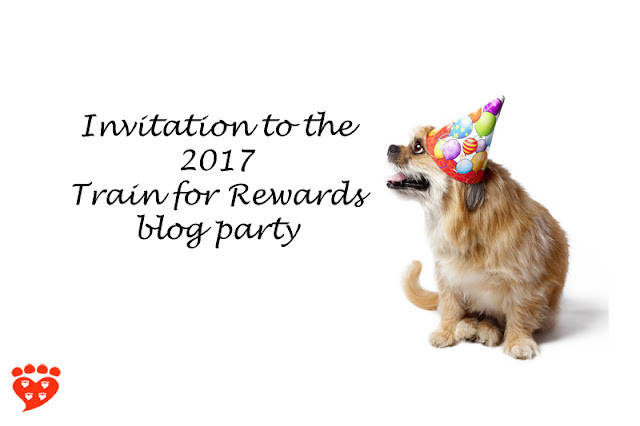 You can add the link to your blog post to the blog party page during the stated times. You need to post the specific permalink to your blog post, not the main url of your blog. If you have pictures in your post, you will have a choice of thumbnails. If you make a mistake or want to choose a different thumbnail, you can delete it and start again, any time up to the deadline. Hi David, The button will become available nearer the time.Thank you in advance for taking part!